This kit fits 5", 6", 7" and 8" chimneys. Used where the chimney passes through a corrugated roof. 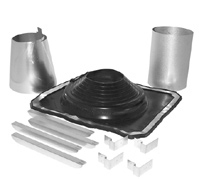 Rubber boot flashing fits roof pitches up to 6/12.